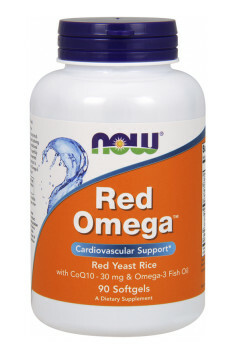 Now Foods Red Omega™ Softgels is an innovative product in which the traditional form of omega 3 fatty acids with many health benefits is fortified with coenzyme Q10, responsible for the body’s energy processes, and Red Yeast Rice, a highly valued ingredient in Asian herbal medicine for its cholesterol-lowering effect. It has been produced carefully to avoid the formation of citrinin which is found often in low-quality products with Red Yeast Rice. Organic Red Yeast Rice (RYR) – the natural product of the fermentation of rice with Red Yeast (Monascus purpureus). RYR has been used for ages as an agent supporting healthy lipid profile and a valuable additive in Far Eastern cuisine. RYR contains numerous natural substances which help regulate cholesterol levels, e.g. monacolins, in particular the vital monacolin K, a compound from the group of statins. One of its mechanisms of action consists in the inhibition of HMG-CoA which induces SREBP2 protein responsible for regulation of sterols. As a consequence, there is increased absorption of cholesterol in adipocytes and liver cells which contributes to reducing LDL levels in the cardiovascular system. Another mechanism of action is an increase in cholesterol absorption through muscle cells which, owing to the presence of statin, may enhance it by 30%, thereby reducing its amount in the cardiac muscle. Studies indicate that statins may help increase gains in muscle tissue when they are combined with physical activity. The observed increase in hypertrophy is explained by reduced selenoprotein levels caused by decreased amounts of isopentenyl diphosphate. * A decrease in cholesterol levels by inhibiting CETP which contributes to increasing blood HDL levels and reducing triglyceride levels. * Support for the nervous system – studies confirm that individuals with increased DHA and EPA levels have been shown to have improved memory, decreased aggression and reduced symptoms of aggression as well as are less prone to stress. * Better glucose metabolism – studies show an improvement in the body’s response to glucose, decreased insulin resistance and a reduced incidence of diabetes. * Promotion of weight loss – by activating PPARαs and increasing adiponectin secretion from adipocytes which contributes to higher energy expenditure. * Enhanced post-workout hypertrophy – it improves fat and glucose metabolism in muscle cells. * Reduced inflammation – by decreasing levels of interleukin-2, TNF-α and interleukin-1β, largely responsible for formation of inflammation. Coenzyme Q10 – a molecule found in the mitochondria. It is especially important to the body’s energy processes and supports the cardiovascular system. It shows also neuroprotective properties. Its main function is to take part in reactions conducted by mitochondria which provide energy for the body. Its proper levels are therefore vital to maintain optimum exercise capacity. Coenzyme Q10 may increase blood flow in individuals with impaired blood circulation. It serves also as an antioxidant for nitrogen oxide which helps it dilate blood vessels. Studies show also that it protects from 3-nitroproprionic acid that is a mycotoxin and potent mitochondrial inhibitor. It has been also shown to be more effective in maintaining dopaminergic functions in the case of neurological disorders. To sum up, Now Foods Red Omega is a product which improves comprehensively the overall condition of the body. However, it will work the best for individuals who want to regulate their cholesterol levels or for whom a standard formula for supplementing omega-3 fatty acids is not sufficient. To avoid gastric discomfort, it is recommended strongly to take the product with meals. In the event of emergency, the dose can be doubled (the dose in clinical studies on Red Yeast Rice amounted to even 2400 mg and caused no apparent side effects). Softgel Capsule (bovine gelatin, glycerin, water, carob), Beeswax, Natural d-alpha Tocopherol and Soy Lecithin. Contains fish (sardines, anchovies, mackerel) and soy. Red yeast rice, produced in the fermentation of Monascus purpureus with rice, is a natural supplement which helps maintain normal blood cholesterol levels. It has been used for ages by Asian herbalists due to its unique health benefits. Adding red rice to a diet may reduce LDL cholesterol levels. It also lowers triglyceride levels and may have therefore an antiatherosclerotic effect. Red yeast rice has also a positive impact on weight loss. Fermented yeast contributes to a reduction in fat cells whereas fiber from this rice makes us feel satiated and thus helps lose weight. Furthermore, it contains many valuable micro- and macroelements, i.e. calcium, manganese, phosphorous, magnesium, zinc, potassium and iron. The next advantage is also the presence of B vitamins, vitamin K, affecting blood coagulation, and vitamin E, which prevents the clumping of blood cells and maintains normal permeability of cell membranes. Red yeast rice has been also shown to support thyroid and liver function, increase the elasticity of blood vessel walls and relieve their tension and stimulate blood flow by dilating blood vessels.